January 18, 2009 by rwb, under Microcontroller. The PIC16F690 microcontroller is one of Microchip midrange 8-bit microcontroller that has a build in 10-bit resolution of Analog to Digital Converter (ADC) peripheral. The ADC is one of the important features that enable us to digitize our analog world. Usually we use the electronic sensor to convert the analog value to the voltage level value. Some of the basic sensor such as LDR (Light Dependent Resistor) is used for measuring the light intensity or NTC (Negative Temperature Coefficient) a special resistor for measuring the temperature. Today many manufactures produce sophisticated sensors for specific task such as sharp GP2D120X is use for distance measurement, National Semiconductor LM35 for precision centigrade temperature sensor, HS12 humidity sensor from GE, TGS2442 carbon monoxide gas sensor from Figaro and many more. Therefore before we can use all of these cool sensors we have to learn the basic of how to use ADC peripheral inside the PIC 16F690 microcontroller. This program basically works by displaying the running LED attached to RC0, RC1, RC2 and RC3 ports on the PIC16F690 microcontroller; the speed of the running LED is controlled by the voltage value reads from the user’s trimport on the port RA0. This voltage value will be converted by the PIC ADC peripheral and passing the converted numeric value as the delay argument on the _delay_ms() function inside the loop. The user’s trimport basically work as the voltage divider circuit and provide voltage input level to the microcontroller analog port (AN0); therefore by changing the trimmer means we change the voltage level input and this also will change the running LEDs speed. The user’s switch is works as a toggle switch, by pressing this switch once the running LEDs will be switched to the blinking LEDs; pressing once again will switch back to the running LEDs. The function of this register is to control the microcontroller ADC operation such as power on the ADC circuit, start converting, channel selection, ADC voltage reference selection and ADC result format presentation selection. 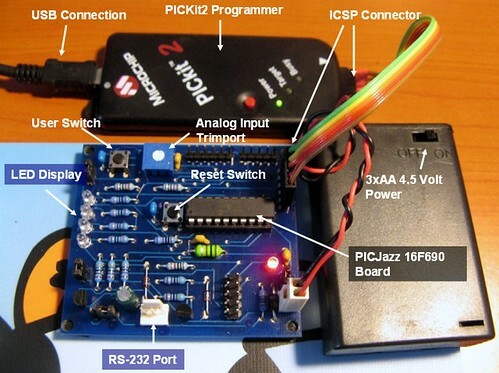 The CHS3, CHS2, CHS1 and CHS0 bits are used to select the ADC input channel, by setting all these bits to the logical “0” means we choose the channel 0 or AN0 (PIN 19) port which connected to the user’s trimport on the PICJazz 16F690 board. In order for ADC circuit inside the PIC16F690 microcontroller to work which is use the successive approximation method, it needs to be supplied with the clock for doing the conversion. This ADCON1 register is used to select the clock sources. For example if you use the external clock of 4 Mhz, in order for PIC16F690 ADC peripheral to accurately converting the analog value you only have two recommended choices either choose the Fosc/8 or Fosc/16. The PIC16F690 microcontroller ADC peripheral is also capable of generating interrupt when it finish the conversion by setting the ADC interrupt flag ADIF bit to logical “1” in PIR1 register, but for the purpose of this tutorial we will not use this facility. Because the PICJazz 16F690 bard use both RA0 and RA1 ports as an input ports (RA0 for user’s trimport and RA1 for user’s switch) then we turn on the tristate input gate on these ports by setting the TRISA to 0x03 and enabling the AN0 analog input selection by setting the ANSEL to 0b00000001 (0x01 hex value). For the LED’s, we just enabling all of the PORTC tristate gate ports as an output by setting the TRISC register to all zero. I’ve compiled this project (created with HITECT PICC Lite version 9.60) using the latest HITECT PICC-Lite Version 9.7 and it work find. Could you be more specific, why it fail to compile? Nice post. Here is one tutorial for PIC18F4520’s ADC Interface. I would like to ask if there is any difference between the left justified method and the right justified method or we get the same result with both methods? In which situations should we prefer the one from the other? It depend on your application, because the Microchip PIC16F690 microcontroller has a 10-bit ADC resolution, therefore if you only need to use 8-bit ADC resolution you use the “left justify” (ADFM=0) method, where you could have the 8-bit ADC value in ADRESH register (just ignore the last 2 bits in ADRESL register). When you need 10-bit ADC resolution then you use the “right justify” (ADFM=1) method, where you could have the 10-bit ADC value both in ADRESH and ADRESL registers as shown in this tutorial. Thanks for quick reply. It was really useful!!! The “x” is the parameter to the _delay_us(x) function definition, while the FOSC is the microcontroller frequency clock definition (#define FOSC 8000000L, the L sign will tell the compiler to treat this value as Long integer) in Hertz. The last is the C language “OR” operator (“|”). The “OR” operator is used to ensure the calculation will always return a minimum value of 1 when x = 0.
why is x should be the value, 164? and need to loop 4 times in order to have 1 ms delay? The number is based on experiment using the PIC16F690 microcontrller 8 MHz internal oscillator (it’s not really accurate). You could use the Microchip MPLAB IDE Stopwatch feature to measure the time used to execute the C code. You could read more about this feature on “Introduction to Microchip PIC Assembler Language – Part 2” article. Hi! I’m using PIC16F877A’s A/D module with the PIC CCSC compiler to implement a simple line following robot. However I’m not getting correct analog readings in the MCU, differing from the actual values(multimeter readings) to a range of about 0.2-0.3V. Please suggest me what to do. And you have put a nice blog, I really enjoy reading your posts. There are many factors that make your ADC result is not as expected. 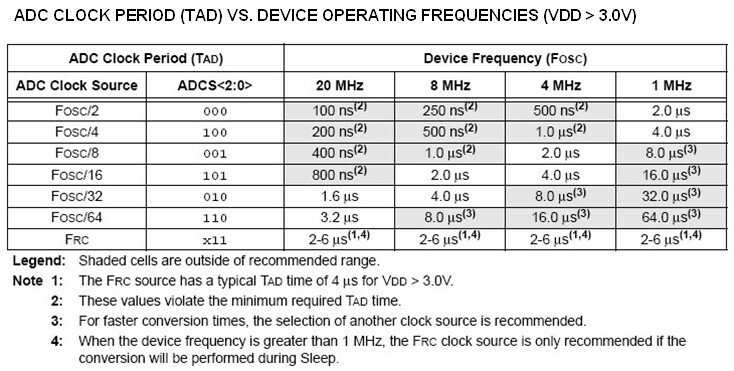 The most common one are the Left/Right Justified, ADC voltage reference, and ADC Clock Source (TAD). What the heck does for(;;) do? Anyone have a good reference (table) for various shortcuts like this one? It’s the C language “for loop” statement without initial and exit condition, therefore it will loop forever. It suddenly became intuitively obvious. I’m having a rough time getting the A/D to work. I’m trying to get a 2 digit readout from 0 to 90 for a dc input of 0 to 5v. I got the displays multiplexed and working first but now cannot get the A to D to work. Thanks very much for excellent examples. But it turned out that I had a hardware problem. i”ve just recently started expirimenting with the PIC 16f690 i am not really expirienced with it as i have been using the 16f84 before.